Thought Process: When I think of Peace the word seems to morph into "peaceful" and when I think peaceful I think trees, forests, nature and cemeteries. It may sound morbid but let me explain. Cemeteries are quiet places where one can think without much interference. Also my mother and I have always enjoyed going into cemeteries and looking at the names, dates and inscriptions on the tomb stones. We wonder about the people each tombstone represents. Who were they? How did they live? How did they die? Recently my family and I went to Washington DC. While there we visited Arlington National Cemetery. The Cemetery is 200 acres of grass, trees and white tombstones and although the surroundings are very peaceful, the immediate effect upon entering the cemetery can be anything but a feeling of peace. Despite my facination with cemeteries and wanting to know about each person who lies buried there, I couldn't help but remember that each person is buried there because of our nation's search for Peace. And no matter how you might feel about the subject of war I think you can't help but feel the irony in this. As a result I felt this image would best represent this month's word. How I made the quilt: I cropped a photo I took while at Arlington and then used photoshop to superimpose the word "Peace" into the grass. I printed the photo in reverse and then took the print to a copy shop to be enlarged and color copied by a copier that uses toner. I then used Citrasolv to transfer the image onto a cotton fabric. I enhanced the image using colored pencils and Paintstiks. 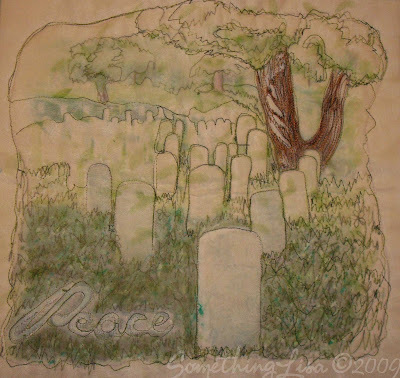 As I quilted the image with my friend Juliette's really cool Bernina, I did a bit of threadpainting on the trees & grass and then quilted around a number of the tombstones and the word "peace." Next I used a homemade foam stamp, which I learned to make when I read the book Inspired to Quilt, to put leaf images across a piece of silk organza. I placed the organza on top of the piece and quilted more. Lastly I cut the organza off of the main tree, the word "Peace" and the foremost tombstone. The edges are left unfinished. Nice. I have similar good feelings about cemeteries. Okay Lisa.... You are BEYOND TALENTED! I didn't understand any of that! I would never know where to start! What a beautiful message. Cemeteries are indeed peaceful places. Sacred places.